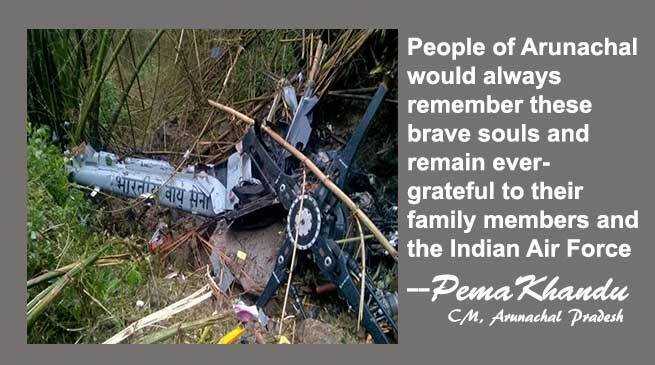 Chief Minister Pema Khandu has expressed deep shock and grief over the now confirmed crash of an IAF Advance Light Helicopter near here on Tuesday and all on board are feared dead. Reportedly a personnel of state police force was also in the ill-fated chopper along with the three crew members of the IAF. In a statement today, the Chief Minister said that the confirmation of the tragic incident has come as a shocker to the people and a pale of gloom has descended over the state, which is struggling to come to normalcy after the fury of nature that has thrown life out of gear. “The brave personnel were on a mission to rescue people stranded due to floods by airlifting them to safer locations. Hundreds of people rescued by IAF couldn’t even thank enough when this tragedy struck like a bolt from nowhere. They are shattered by the news and mourn the death of their saviours,” Khandu said. He said it is a very sad moment for everyone that a rescue operation ended in such a tragedy and conveyed heartfelt condolences to the bereaved family members. Appreciating the search team including security and paramilitary forces, state police and village volunteers for spotting the remains of the ill-fated chopper, Khandu hoped that remains of the departed personnel are safely brought back and given a farewell befitting to those who make the supreme sacrifice in the line of duty. “People of Arunachal Pradesh and particularly those who were evacuated by IAF would always remember these brave souls and remain ever-grateful to their family members and the Indian Air Force,” Khandu added.